I had a conversation with a student yesterday that illustrated all that is wrong-headed about public education. Our school is fortunate enough to have an awesome selection of science electives, thanks to a forward-thinking principal we had ten years ago. I teach an introductory neuroscience class, which is a great deal of fun for me and (I hope) the students -- we get to spend a semester looking at the intricacies and peculiarities of our brain and sensory processing systems. The subject is one that seems to have a lot of intrinsic interest for high schoolers, and it's often the genesis of some pretty cool class discussions. Last week I assigned them to read an article called "The Future of Brain-controlled Devices," about the possibility of brain-machine interfaces, and we discussed it in class yesterday. What I had anticipated would be a ten-minute discussion of the scientific and ethical questions raised in the article turned into a whole period's worth. The topics jumped, free-association-style, away from the subject at hand -- sensory enhancement, brain-to-brain connections ("machine-mediated telepathy"), virtual reality interfaces, restoration of sensorimotor abilities in the disabled -- and soon we found ourselves discussing the nature of seizure disorders, the role of sleep in memory consolidation, how the pleasure-reward circuit in the brain works, what happens when someone has a migraine, how visual pattern recognition works. When the bell rang, one of my students chuckled, and said, in an amiable sort of fashion, "Wow. We really got nothing accomplished this period." She indicated the blank page in her science notebook. "We didn't even write down any notes. After we turned in the responses to the article, we just spent the rest of the period talking about random stuff." I smiled and shrugged -- as I said, she's a nice kid and a good student, and didn't mean it as any kind of serious criticism -- but inwardly, I was a little appalled. Here we have a senior in high school who has been taught, in her thirteen years in public schools, that a wide-ranging class discussion driven by the students' own curiosity, which never leaves the purview of the class's curriculum, somehow doesn't count unless they are made to write down lists of vocabulary words so they can study it later for the test. These kids were focused and engaged, actively pursuing questions that they were interested in, driving their own learning and using me as a resource and a facilitator. Not a single one tried to derail the conversation into other subjects; no one said, "So Mr. Bonnet, how do you think the New Orleans Saints are gonna do this year?" We may have wandered off of the topic of brain-machine interfaces -- but would I really have been doing a better job as a teacher had I halted the discussion, and said, "Okay, stop asking questions. On to the next topic, which is neurological disorders. Get your notebooks out...."? I think public schools, despite amazing obstacles, do a pretty damn good job of educating children. But we do teach them an unintended lesson, one which some of them never unlearn. It's the lesson that education is a passive enterprise, with the teacher as the knowledge donor and the student as recipient. We tacitly pass along the message that if the information isn't on the test, they don't have to think about it, that it isn't worth knowing. That we'll tell them what to write down, we'll decide for them what counts, that learning consists only of copying everything we write on our white boards into their notebooks. And it's a notion that is fostered at every level. If it's not a Quantifiable Outcome, if you can't measure it on a standardized test, to the federal and state departments of education, it does not exist. 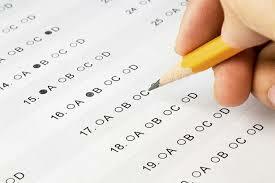 And just last week, the New York State Board of Regents voted to increase the impact of standardized tests by raising to 50% the contribution of exam scores to a teacher's end-of-year evaluation. But we're apparently not supposed to ask questions about that, either. You have to wonder why the powers-that-be in education seem so dead set against fostering creative, out-of-the-box thinking in children... or in the teachers themselves. What does it mean to be truly educated? It means having some kind of knowledge base, some fundamental set of facts at your disposal, sure. But it's far more than that. Education should foster creativity, drive, the ability to make new connections, the confidence and skill to be the author of your own understanding. The If-It's-Not-On-The-Test-Don't-Waste-Your-Time mentality has warped what should be the true mission of schools -- to give children not only a set of tools, but a passion that will push them never to stop questioning, never to stop learning about the world around them. And that memorize-and-test attitude has poisoned the children themselves. I see it especially amongst the best and brightest, in the anxiety over scores, the fretting over learning every last definition, date, and detail. Synthesis and questioning become a distraction. They've learned their lessons well, and come away with the impression that minutiae are more important than curiosity. We've come a long way from the original meaning of the word "education," which comes from a Latin verb meaning "to draw out of." We've come to think of it as stuffing facts into children's minds, and after that, more facts still, and judge our success by how many of those facts they can successfully regurgitate on the end of the year tests. How many opportunities for questioning, how many "teachable moments," are lost because we are chained to Student Learning Objectives and Measurable Outcomes? I'll end with a quote from Socrates which I think sums the whole thing up: "Education is not the filling of a vessel, it is the kindling of a flame." Have you shared these thoughts with your class post-discussion? You should.